It tackles the causes of dyslexia. Most dyslexia programs are phonics or instruction-based. They replicate the school experience and school methodology, working around the underlying problems that cause dyslexia. By contrast, Fast FordWord works on the cognitive skills that cause dyslexia as well as reading skills. Second, our exercises are self-paced whereas most instruction is static. At school and for many tutors, the curriculum is set. And unless your child is receiving one-on-one instruction, the class moves on whether your child is ready or not. By contrast, our software is adaptive. Each of our students has a different experience. Their pathways through the software vary according to their unique learning makeups and needs. Our elementary and middle-to-high school dyslexia programs look quite different. This is because their goals are different. The elementary age goal is phonological awareness to make decoding easier. For older children the target is reading automaticity and reading comprehension. All Gemm Learning students go through the same set of foundational cognitive exercises, vocabulary and language exercises and then age-appropriate reading exercises. However their path through these exercises will vary significantly according to age and ability. Most of our elementary-age dyslexic students will spend 2-3 months or more in the cognitive programs, developing language processing and related skills they lack, but need, for phonological awareness and decoding. Older students receive a boost from these exercises in a much shorter period. For them, it is the exercises that build reading-specific skills that take the time, such as spelling and reading comprehension with critical thinking. Our average student takes 4-6 months. However, dyslexic children typically take a little longer. Here’s what to expect from, our reading program for dyslexia by age. While memorization of long word lists helps many dyslexic children cope with reading early on, eventually the list expands to the point it is not manageable. At that point unless your child needs to learn how to sound out, decode every word automatically, otherwise she will struggle mightily. Therefore, without an intervention, dyslexic children risk developing a negative connection to reading that can last a lifetime. This where our dyslexia programs can make a difference. If we can help children overcome their reading disorder, if we can shorten the learn to read phase and make reading easier, a much more positive attitude to reading can develop. This has its own set of rewards. Our software takes a multi-pronged approach to making reading easier for children with dyslexia. It works on language processing and cognitive skills, and it strengthens vocabulary and spelling all of which helps fluency. Finally, it works on the basics of reading comprehension. Reading programs for dyslexia in particular need to be engaging. This is because children with learning disabilities, including dyslexia, often struggle with focus, making routines that require repetition hard to stick with. To be effective, your child has to stay with the routine. Therefore, the exercise design has to be all about student engagement. Our dyslexia programs have a computer game feel, with reward sounds and counters that hold student attention and interest in every session. As per the chart, elementary-age students typically need more time in the foundational programs, Language v2/ Foundations I and Language to Reading v2/ Foundations II than older children. Many dyslexic children will have time to complete at least one age-appropriate reading series program. This break-down of time will serve your purpose. The reading series is mainly about reading acceleration. The more critical metric is making reading easier, and this we hope to accomplish in the first few months in the cognitive series. As long as your child leaves us reading more willingly, the extra daily practice will gradually build these reading-specific skills. None of this will happen however if your child does not read regularly. So that has to be priority number one. The symptoms of dyslexia are different in older children and teenagers, and they find less novelty in a computer game feel. And so the reading program for dyslexia in older children has to be different. And Fast ForWord is. The goal is less about phonemic awareness and more about reading automaticity. Older children have already developed many of the basic sounding out skills needed for reading, they are just no automatic. As a result, our program has a different track for older children, starting with Literacy and Literacy Advanced. These issues all point to an inefficient reading style. A lack of automaticity in decoding and therefore an inability to think and comprehend while reading. By making decoding automatic, less concentration is required. This means decoding is less distracting and reading comprehension is more efficient. Our programs for children over 10 and teenagers also start with cognitive skills training — Fast ForWord Literacy and Literacy Advanced. They use the same science and go after the same cognitive skill gaps as Language and Language to Reading. However, to hold the attention of older students, they have more mature graphics. Furthermore, the exercise difficulty curve is laddered more steeply so that students can move through the material faster. Finally, they use more challenging vocabulary, spelling and listening comprehension exercises. Typically students will have enough time to do two reading programs in the Fast ForWord reading series. As per the table above, they will typically start with Reading Level 2 or Reading Level 3, depending on their skill level. 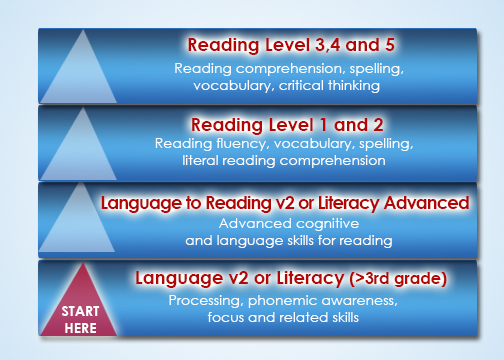 Finally, Reading Levels 3, 4 and 5 build reading comprehension skills, such as inferential thinking, vocabulary, grammar, spelling and sentence completion. In addition, they develop metacognition, the ability to think critically and self correct while reading called metacognition. Gemm Learning has had a decade of experience in delivering home-based reading programs for dyslexia. The software is online with remote professional oversight and guidance. Watch a video on how we help dyslexia or call one of our specialists for a free consult.